Energy Industry Says N.H. Could Soon See Offshore Wind, Modernized Grid, More E.V. Chargers | NH's energy future is now! 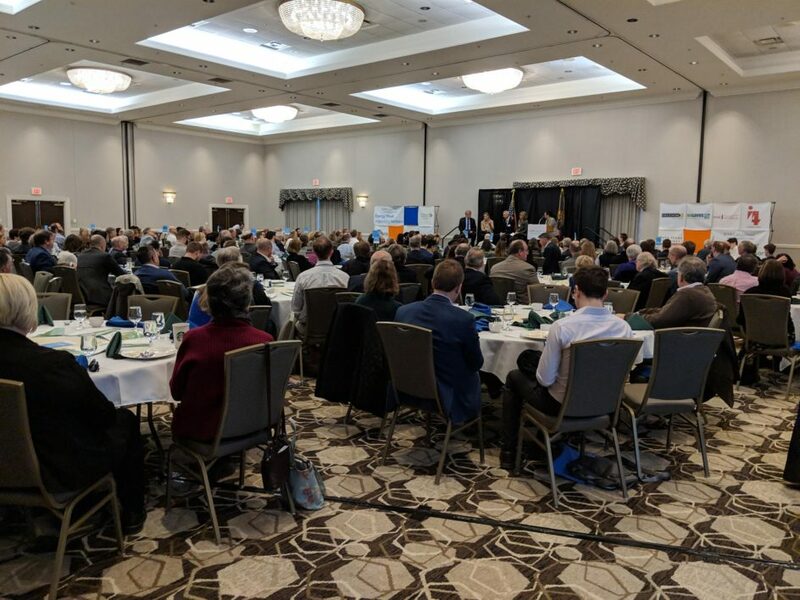 Energy industry players announced big plans for the future of New Hampshire’s electric grid at a conference in Concord Thursday — even as some progressive energy ideas continue to stir controversy in state government. A major offshore wind developer says it plans to explore the possibility of involving Pease International Tradeport in its business. Bill White is the North American director for the German wind company EnBW, which recently joined the trade group Clean Energy New Hampshire after Gov. Chris Sununu requested a federal task force that’s the first step toward potential offshore development. White was interviewed at the group’s spring conference by New Hampshire Public Radio podcast host Sam Evans-Brown. He says the next generation of wind turbines will have to be built on the coast, because they’ll be too large to move over highways. Advocates say Pease Tradeport could support that manufacturing for the Gulf of Maine. White says his firm plans to look into it. Meanwhile Eversource, New Hampshire’s largest utility, says it’s moving forward quickly on plans to decentralize and modernize the state’s electric grid. Charlotte Ancel is in charge of clean energy strategy for the company. She says that in 1990, Eversource had 2,000 of what it calls “grid-connected generators” – power plants and customers, large and small, who are making power and putting it onto the regional grid. NHPR’s Sam Evans-Brown, left on stage, interviews EnBW North America director Bill White about offshore wind development in the Gulf of Maine. Ancel says half that vision is about large-scale renewable energy. The other half is about new systems and programs to lower demand for electricity, instead of building more poles and wires or power plants to supply power for a higher level of demand. Alongside these efforts, she says Eversource is prepared to build a corridor of high-speed electric vehicle charging stations in New Hampshire as soon as next year. The conference is put on by Clean Energy N.H., the Nature Conservancy, the sustainable business lobbying group Ceres and other players in state energy policy. Gov. Chris Sununu spoke at the conference last year. He previewed his “New Hampshire-first energy policy” and announced funding from the Volkswagen emissions settlement would go to electric vehicle charging infrastructure. Sununu said then that his energy strategy would let New Hampshire “have our cake and … eat it too” on encouraging renewable development while lowering energy rates. But since then, Sununu has sparred with Democrats and sometimes Republicans on how to make that happen. He’s promised to veto many pro-renewable bills in the works this year, arguing they would raise rates. Conference organizers say Sununu was not invited to speak at this year’s conference because they want to alternate years in which the same headline speakers appear at the event.